Yesterday, June 1, 2016, the Gotthard Base Tunnel (GBT) was opened. Its commercial services will commence on December 2016. It is a railway tunnel that goes through and under the Alps in Switzerland. The GBT is the longest and deepest traffic tunnel in the world and the only flat low-level route through the Alps. The GBT’s length is 57.09 km and is composed of 151.84 km os tunnels, shafts and passages. The GBT’s main purpose is to increase freight transport capacity across the Alps, particularly the Rotterdam-Basel-Genoa corrider that stretches from the Netherlands through Central Europe all the way to Italy. It is a bypass to the Gottharbahn that is a winds down the Alpine mountains and was opened in 1882. It is the third tunnel through the Alps after the Gotthard Tunnel and the Gotthard Road Tunnel. Aside from easing the traffic on the earlier tunnels that are operating at full capacity, the GBT will decrease the travel time of goods that are mainly being transported using trucks. This will decrease the environmental impact of fossil fuel powered vehicles since freight will be transported by electric rail. A referendum for the project was approved by the Swiss in 1992 and construction began in 1996. 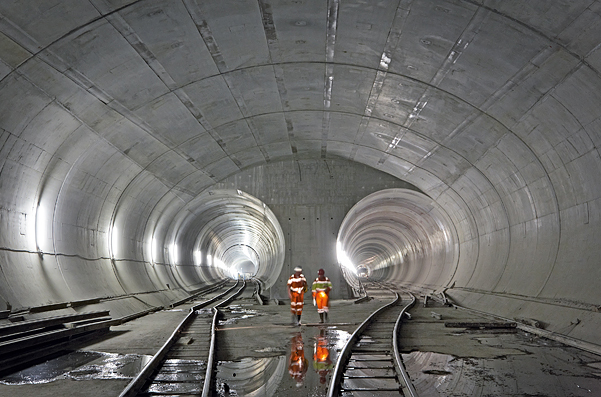 The tunnelling breakthrough was achieved in 2010. The project cost was US10.3 billion. • • "Commissioning". Lucerne, Switzerland: AlpTransit Gotthard Ltd. Retrieved 2016-05-12. • • "155 days until opening". Lucerne, Switzerland: AlpTransit Gotthard AG. Retrieved 29 December 2015. • • "Project data – raw construction Gotthard Base Tunnel" (PDF). Lucerne, Switzerland: AlpTransit Gotthard Ltd. Retrieved 2016-05-12. 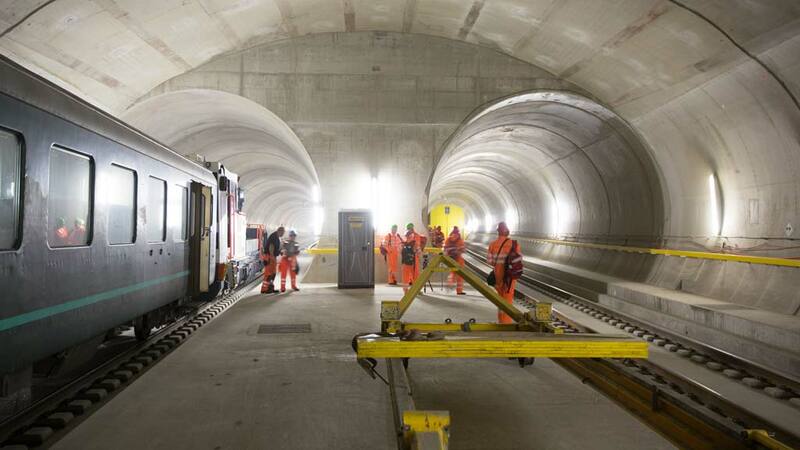 • • "World's longest and deepest rail tunnel to open in Switzerland". BBC News. Retrieved 2016-06-01. • • "Gotthard- und CeneriBasistunnel: die neue Gotthard-Bahn nimmt Gestalt an" (PDF). Geomatik Schweiz. Retrieved 8 June 2015. • • "Wer hat die grösste Röhre?" [Who has the longest tube?]. Tages-Anzeiger (graphical animation) (in German) (Zurich, Switzerland). 14 April 2016. Retrieved 2016-05-11. • • Monnat, Lucie (11 December 2014). "Le tunnel de base du Gothard révolutionnera le rail dans deux ans". 24 heures (Lausanne). Retrieved 2015-06-07. • • "Chronology of a Project of the Century: Milestones in the Construction History up to 2010" (PDF). AlpTransit.ch. Archived from the original (PDF) on 13 March 2012. Retrieved 20 April 2013. • • "Swiss create world's longest tunnel". BBC News. 15 October 2010. Retrieved 15 October 2010. • "Gotthard Base Tunnel to be operational from 2016". Lucerne, Switzerland: AlpTransit Gotthard AG. 22 August 2011. Retrieved 12 November 2011.